California is a world leader in renewable energy. The state already sources nearly one-third of its power from renewables, mainly solar and wind. 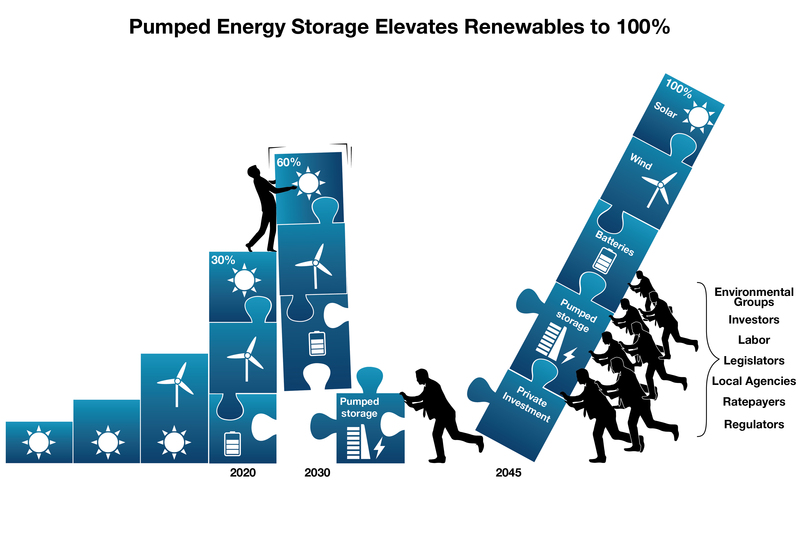 The target for clean energy in California is 100 percent by 2045 - and large-scale energy storage in the form of pumped energy storage will play a vital role in reaching that goal. A major shift to renewables will require new kinds of investments, markets, and business practices. Electric grids will need to be more flexible; new kinds of power supplies will help deliver energy flexibility when needed; and new pricing systems are needed to send clear signals to consumers so that they adjust their energy based on the times of day when electricity is most plentiful. 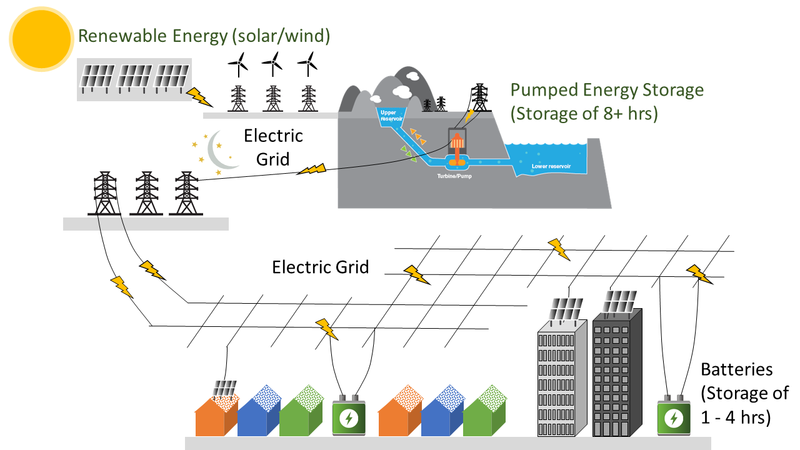 Pumped energy storage projects are designed to store excess renewable energy from solar and wind during the day, and then discharge that energy when energy usage increases in the evening and renewable energy is not available. A 2019 white paper highlighted the importance of pumped energy storage to California’s renewable energy future. One of the most promising pumped energy storage solutions in California is the San Vicente Energy Storage Facility under consideration in San Diego County. This project could store 4,000 Megawatt-hours per day of energy (500 Megawatts of capacity for eight hours). The potential project would create a small upper reservoir above the San Vicente Reservoir, along with a tunnel system and an underground powerhouse to connect the two reservoirs. The powerhouse would contain four reversible pump turbines. 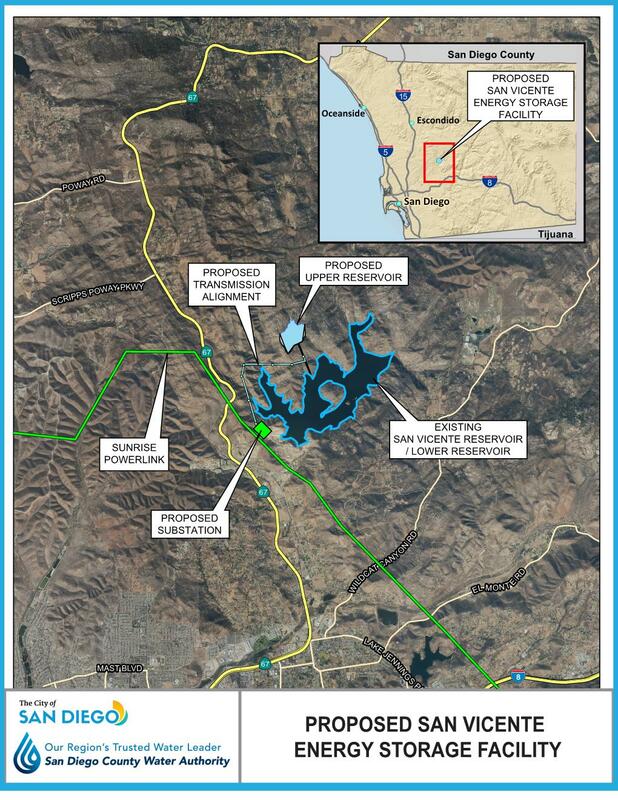 The reservoir is near the terminus of the Sunrise Powerlink, which would allow the project to play a central role in integrating solar and wind energy from across the Southwest for use in San Diego County. During off-peak periods - when power is inexpensive and renewable supplies from wind and solar facilities exceed demand - turbines would pump water to the upper reservoir where it would act as a battery of stored potential energy. During high energy use, the system would create clean energy as water from the upper reservoir flows downhill through the turbines. The exchange between the two reservoirs would not consume water and is closed-loop. San Vicente Dam and Reservoir are owned and operated by the City of San Diego. The Water Authority completed raising the San Vicente Dam in 2014, and owns 157,000 acre-feet of water storage capacity in the expanded reservoir. These public agencies prepared and submitted a joint Preliminary Application Document and Notice of Intent to the Federal Energy Regulatory Commission (FERC), the agency responsible for approving pumped energy storage projects, on July 28, 2015. The preliminary application outlines the plan for implementing the potential project, identifies what environmental resource studies are needed, and is a precursor to submitting a formal FERC license application. On October 29, 2018, the two agencies received a new four-year preliminary permit from FERC. Planning and investing for large-scale energy projects like the San Vicente Energy Storage Facility takes time. It is important to take steps now to ensure this potential project can help California realize a clean energy future.